Helge Scherlund's eLearning News: eSchool News Online! Several events planned to commemorate the man whose theory of natural selection changed science forever. It's well known that Charles Darwin's groundbreaking theory of evolution made many people furious because it seemed to contradict the Biblical view of creation. But few know that it also created problems for Darwin at home with his deeply religious wife, Emma. Darwin held back the book to avoid offending his wife, said Ruth Padel, the naturalist's great-great-granddaughter. "She said he seemed to be putting God further and further off," Padel said in her north London home. "But they talked it through, and [Darwin's wife] said, ‘Don't change any of your ideas for fear of hurting me.'" The 1859 publication of "On the Origin of Species" changed scientific thought forever--and generated opposition that continues to this day. 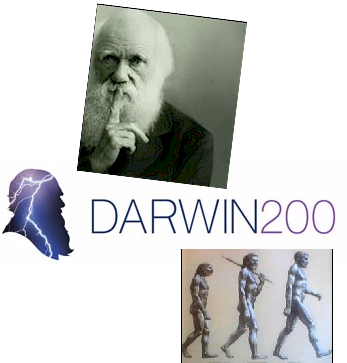 It is this elegant explanation of how species evolve through natural selection that makes Darwin's 200th birthday on Feb. 12 such a major event.